The new Starbucks tumblers for the season have just been released, and I managed to get two of them! Didn't get the metal ones as I wasn't so into the design. The metal ones for Spring 2012 look rather blah. 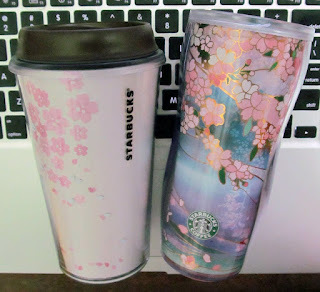 Instead, I picked up two of the plastic Starbucks tumbler for the sakura collection. A comparison between the 2012 and 2011 tumblers... the design for the 2012 tumbler is definitely more plain, as it is modeled after the actual coffee cup. This type of tumbler and cup design is all the rage now. I've seen countless ceramic ones shaped like a paper cup, including those from Lock and Lock. The 2011 design is definitely more loud and flashy, with the gold outline. Shape-wise, 2011 tumbler does feel better in the hands. The 2012 one seems kinda hard to wash, with the cap being shaped like the actual coffee cup. The opening to drink from is tiny! Nonetheless, I still like the tumbler. Looks great on my workspace, and it's simple yet alluring. Shall review the other tumbler soon!